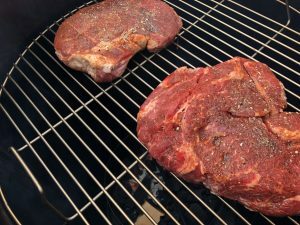 Have you ever thought about cooking on a Gateway Drum Smoker? 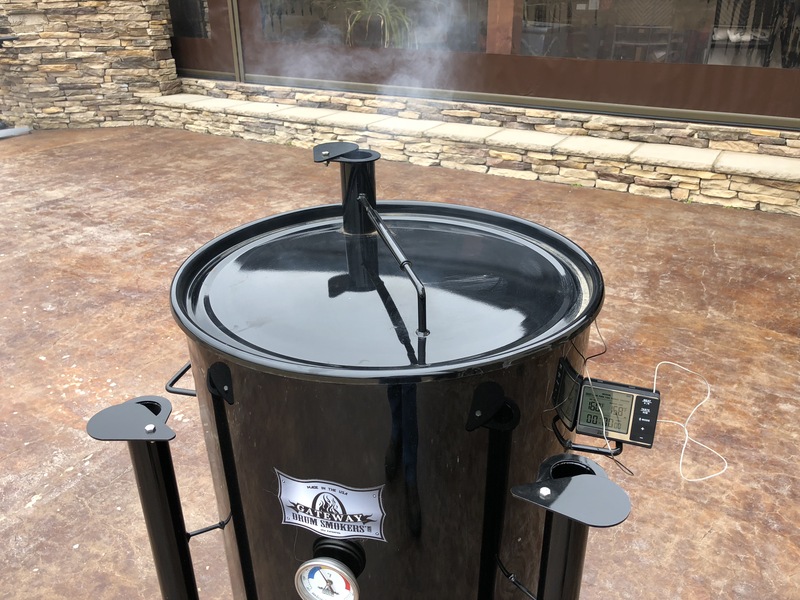 Want to know what a drum smoker is? 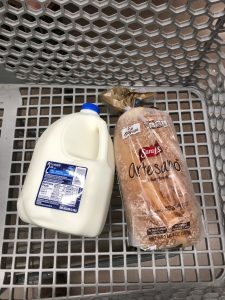 Read on for my review and some cooking processes! Back in the day, old farmers referred to someone who had a lot of land, but not much money, as “land poor.” In that spirit, I’ve been “cooker poor” for awhile now! I like to have lots of different options for smokers and grills! When I am competing in KCBS contests, I have a Jambo cooker. For Memphis in May I use Backwoods Smokers. All of my restaurants use LARGE Ole Hickory or Southern Pride smokers and trailers. When you feed thousands of peeps a day, you need BIG cookers! 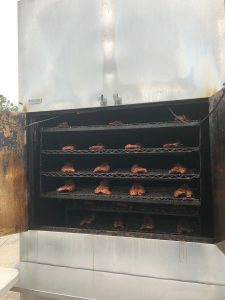 Most of those are large smokers, and for a house or backyard you usually don’t need (or want) something capable of cooking a 200+ lb whole hog (well, maybe you do, but let me tell you it’s not convenient when you just want to cook 2 slabs of ribs.) So, for the house and backyard, my most used items have been a Big Green Egg, a Meadow Creek grill, and a Fire Magic gas grill (yes, very occasionally I use a gas grill!) I also use the Jambo at the house a lot as well, so that adds some capacity if I’m cooking for multiple people. All my cookers aside, I do love to try new cookers and grills out and see how they cook. 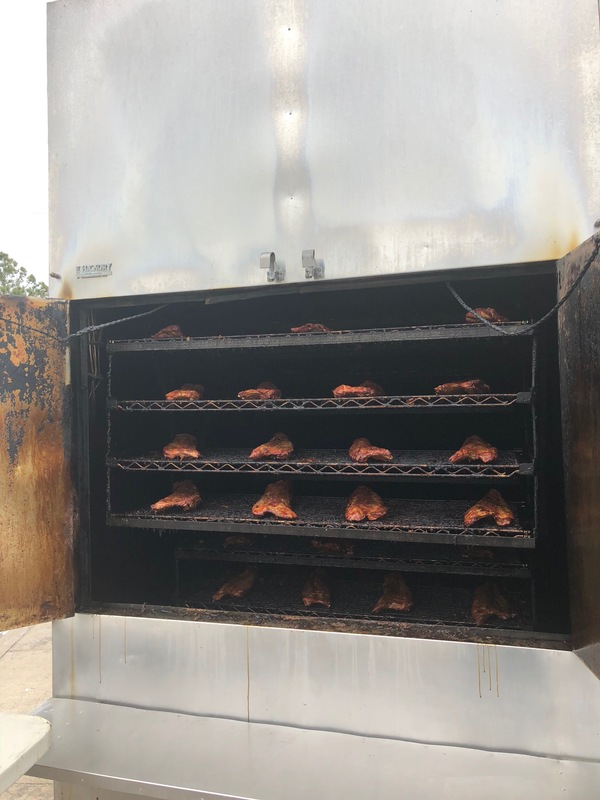 On the KCBS circuit this year, I met Tim Scheer, who owns Gateway Drum Smokers. Tim is awesome on the competitive circuit, and wins tons of awards and Grand Championships, cooking on Drum Smokers. this past year, he came in 2nd overall for the KCBS Team of the Year, and has won tons of awards. Pretty dang impressive. I talked with him about his drum smokers before, and he has always said they cook extremely fast and are simple to use, so I decided to try one out. As a side note, I generally have a lot of intentions to get things done, or try something new. Like a lot of people, I tend to get caught up dealing with life however, and sometimes things get pushed to the back burner. My drum smoker experiment is one such thing. I purchased one in the summer of 2017, with strong intentions of quickly using it. However, it took a recent blizzard (well, we got an inch or so of snow, but it shut everything down!) for me to get around to breaking it out and firing it up. A recent snowfall left me with an option of milk and bread or Smoking some meat! What is a Drum Smoker? 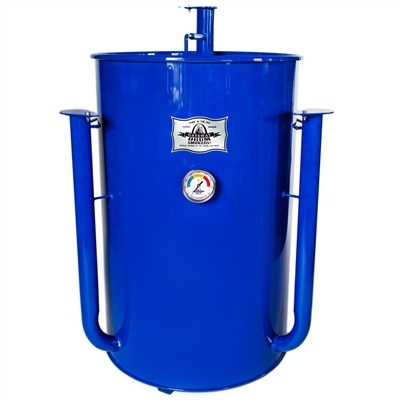 A drum smoker is basically what it sounds like- a 55 gallon (or smaller) metal barrel or “drum” that has been modified into a grill or smoker. For years people built these themselves, usually using repurposed barrels, and they were known as UDS’s (Ugly Drum Smokers.) Now, you can purchase kits to make your own out of your own barrel, or just simply purchase one online. While there are several brands of drum smokers available, Tim’s products always looked very good and well built. I would rather spend my time cooking than building one, so I bought mine from Tim. 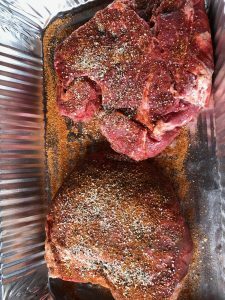 I wanted to start simply on it, so I decided to try a chuck roast on it. Smoked Chuck Roast you say? I say YES! They’re delicious, and can be used for so many things! 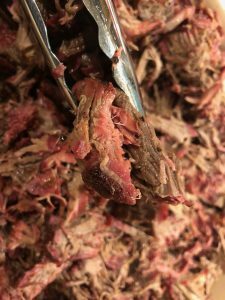 You can smoke the roast just to add some flavor to a dinner, or cook it to shred and use it for some wonderful beef sandwiches or tacos. I recently purchased a side of beef from a local university program that is part of a curriculum for meat science degree (yes, there is such a thing, and yes, the people who I know that have these degrees are badass butchers!) We dry aged the beef, then butchered it into a freezer full of meat (including lots of roasts.) So, I needed to cook some beef, and I had a new smoker to try. Marriage made in heaven! As this was about the cooker, I wanted to cook the roast fairly simply. I seasoned the 5 lb roast with a light coating of my Ultimate BBQ Rub, then a light coating of Grillin’ Shake. With my drum smoker fired up to 270 degrees, (with a charcoal base and 2 small chunks of pecan wood) I put the roast on the grate and let it cook. 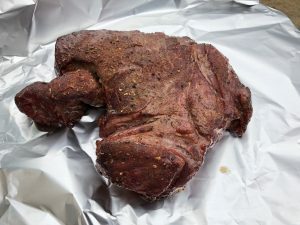 After the chuck roast hit 160 degrees, I wrapped it in foil, adding 1/2 cup of beef stock to the foil, and put it back on. 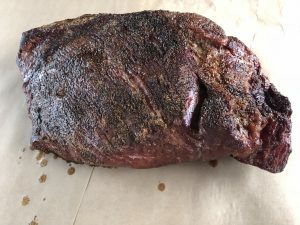 I began checking the tenderness when it reached 204 degrees, but ended up letting it cook until it reached 210 degrees (after consultation with Tim) and was “fork tender.” After removing from the smoker, I let it rest for an hour. I shredded the meat, then added some sautéed onions, peppers and provolone cheese and had one of the best smoked beef sandwiches I’ve ever eaten. Total cook time? 3.5 hours. Let me repeat that… I cooked a 6 lb roast to “pulling texture” for a total of 4.5 hours (including rest time!) Was it dark or burned or scorched? Nope. It was just as pretty (or prettier) than if I had put it in the oven, and had a much better flavor to boot! 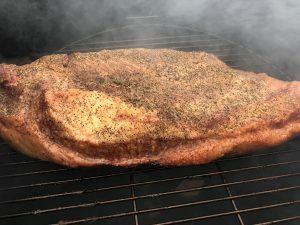 Check out the beautiful smoke color in the pulled meat in the pic below! After the successful chuck roast cook, I decided to try something I have a lot more experience with on the grill- a brisket. 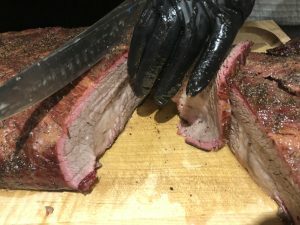 I picked a full “packer” brisket (meaning a brisket containing both the “flat” and the “point”) and prepared the grill. Again, I decided to cook it in a simple manner- I wanted to learn about the cooker, not the meat, if that makes sense. I trimmed it very lightly, seasoned with salt, pepper and garlic, and put it on the drum smoker with the temp running at 275 degrees. I smoked it uncovered for 2.5 hours, then wrapped in butcher paper for 2.5 hours, then let it rest for an hour. It sliced beautifully, with an incredible smoke ring, great moisture and awesome flavor. Look at that beautiful smoke ring! Now, to put this in perspective, I cook brisket flats in competitions. I usually cook them at 275 for 6-7 hours, then a 1-2 hour rest. (I am also cooking wagyu meat in contests, vs the choice grade I cooked for this test.) Frankly, I was blown away by the cooking speed and the quality. I would have been happy to have turned this brisket in for judging at a contest. The best part was I cooked a full brisket in less time than normally cook just the flat. Amazing! Why does the Drum smoker cook so fast? I still don’t really know, other than it’s a “direct style” cooker. The cooking chamber is not too large, so the heat is not lost and transfers to the meat very well. I was very concerned that it would either overly darken the meat or burn it, but it absolutely did not. I was very pleased with how it performed. Until later, keep it smoking!